ThermaMax 1407 Wax, 4.1" x 500' Black Wax Ribbon. Compatible with Industrial Printers. 12 ribbon case. Used with paper labels. ThermaMax 2202 Mid-Range, 3" x 500' Black Wax-Resin Ribbon. Compatible with Industrial Printers. Single ribbon. Used with polypropylene labels. ThermaMax 1407 Wax, 4.1" x 900' Black Wax Ribbon. Compatible with Desktop Printers. 6 ribbon case. Used with paper labels. ThermaMax 3202 Resin, 4.1" x 1500' Black Resin Ribbon. Compatible with Industrial Printers. Single ribbon. Used with polyester labels. ThermaMax 2202 Mid-Range, 4.094" x 500' Black Wax-Resin Ribbon. Compatible with Industrial Printers. Single ribbon. Used with polypropylene labels. ThermaMax 1407 Wax, 2.35" x 900' Black Wax Ribbon. Compatible with Desktop Printers. Single ribbon. Used with paper labels. ThermaMax 1407 Wax, 4.1" x 1500' Black Wax Ribbon. Compatible with Industrial Printers. 12 ribbon case. Used with paper labels. ThermaMax 3202 Resin, 6.732" x 500' Black Resin Ribbon. Compatible with Industrial Printers. 24 ribbon case. Used with polyester labels. ThermaMax 3202 Resin, 2.09" x 500' Black Resin Ribbon. Compatible with Industrial Printers. Single ribbon. Used with polyester labels. ThermaMax 3202 Resin, 4.094" x 500' Black Resin Ribbon. Compatible with Industrial Printers. Single ribbon. Used with polyester labels. ThermaMax 2202 Mid-Range, 2.795" x 500' Black Wax-Resin Ribbon. Compatible with Industrial Printers. Single ribbon. Used with polypropylene labels. ThermaMax 1407 Wax, 2.05" x 1502' Black Wax Ribbon. Compatible with Industrial Printers. Single ribbon. Used with paper labels. ThermaMax 1407 Wax, 4.17" x 750' Black Wax Ribbon. Compatible with Industrial Printers. Single ribbon. Used with paper labels. ThermaMax 2202 Mid-Range, 3" x 1500' Black Wax-Resin Ribbon. Compatible with Industrial Printers. Single ribbon. Used with polypropylene labels. ThermaMax 3202 Resin, 2.09" x 1503' Black Resin Ribbon. Compatible with Industrial Printers. Single ribbon. Used with polyester labels. ThermaMax 2202 Mid-Range, 3.15" x 900' Black Wax-Resin Ribbon. Compatible with Desktop Printers. Single ribbon. 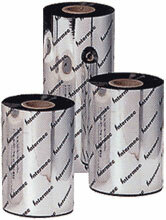 Used with polypropylene labels.